The board is typical of Intel: the PCB is developed so that the costs of production of two versions on the same chipset can be minimal. Like before, the board has a lot of free space on one edge, but this time it has relatively small dimensions. We got a preproduction sample, that is why there are no many accessories. The layout and flaws are also standard: audio-ins are in front of the PCI slots; the element base is scanty because almost the same PCB is used in the microATX version; when a video card is installed it's difficult to handle the memory modules. It's not difficult to reach the only jumper on the board even when the board is already installed. Its function is shown on the textolite. The 2-channel switching voltage regulator incorporates 3 capacitors of 3300 uf and 2of 2200 uF. The following controllers are integrated: an audio one based on the chipset's capabilities and AC'97 codec Analog Devices AD1981A with an output for front audio connectors; a network one based on the chipset's capabilities with the 10BaseT/100BaseTX support. Non-unsoldered connectors: a CNR slot and a USB connector. The system monitoring is supported by the SMSC LPC47M172-NR chip. Processor voltage (+/-3.3, +/-5 and +/-12 V), speed of 2 fans and temperatures of the processor (a built-in sensor) and the board (a built-in sensor) can be controlled. There are 2 connectors for adjustable connection of fans and one for non-adjustable connection. 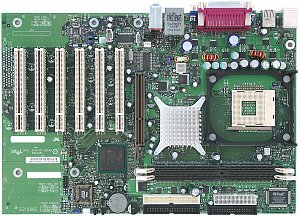 Brief characteristics of the board: memory slots - 2 DDR SDRAM; expansion slots - AGP/ 6 PCI; I/O ports - 1 COM/ LPT/ 2 PS/2/ 4 USB 2.0; dimensions - 305x210 mm. We used the latest available version of the BIOS - 1017.D. I don't have any impression from this board, except the DDR333 support which is quite unusual for Intel, especially considering that the chipset doesn't support it officially.